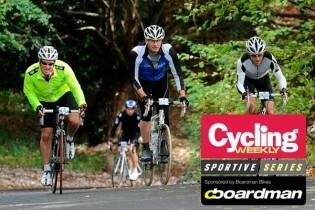 Last year Cycling Weekly promoted two sportive events run by the experienced UK Cycling Events team; they were obviously a great success as Cycling Weekly have announed today that they’re extending the series to seven events for 2013. The events will continue to be run by UK Cycling Events and will also see Boardman Bikes come on board as a sponsor. The series now features new events in Wiltshire, East Sussex, Devon, North Yorkshire and Worcestershire – adding to two already established Surrey-based events. Chris Boardman – R&D Director and Co-Founder of Boardman Bikes, expressed his delight in being involved with the Cycling Weekly Sportive Series, “2012 was an incredible year for cycling. Our partnership of the Cycling Weekly Sportive series and its huge success was one of our many highlights. This year Boardman Bikes are really pleased to again be the official partner of the new extended series across the country. We hope that everyone will be inspired to join us at the events and to take up the challenge of a sportive in 2013,” said Boardman. The Cycling Weekly team are also hugely excited about the expansion of the Sportive Series. Publishing director, Keith Foster said “The events are a perfect opportunity for the team to interact and ride with readers up and down the country. We hope to showcase the very best sportive day out”.